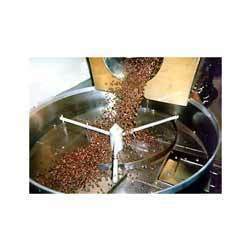 Chaithanyaa Coffee is a renowned name in the trading and supplying of qualitative coffee roasters. These roasters are manufactured by our associated vendors who make use of quality materials and components. Besides, we also test these products stringently on several quality parameters to ensure their superiority and excellence. These roasters are designed in such a manner that ensures their noiseless and vibration free working. These coffee roasters have controlled environment to ensure best of the roasting process. Chaithanyaa Coffee was established in the year 1977 as a sole proprietorship firm at Bengaluru, Karnataka (India). We are one of the prestigious manufacturers and suppliers of an outstanding range of All types of Coffee / Chicory and trader of Coffee Equipments / Stainless steel cleaner from USA. Apart from this, our company is engaged in?trading and supplying high grade coffee. Our range of coffee machines is widely appreciated by clients, owing to their easy installation, rugged construction, simple operations and many more features. Be it tea or coffee, our products are processed from high quality leaves and seeds, which imparts them a mesmerizing aroma and an exclusive flavor. Our manufacturing facilities are kept up-to-date by the management as we aim at delivering high class products in the market.